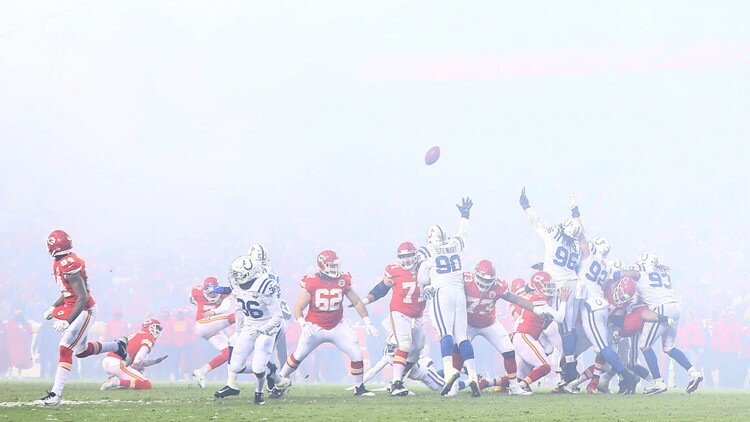 Harrison Butker #7 of the Kansas City Chiefs kicks an extra point during the AFC Divisional round playoff game against the Indianapolis Colts at Arrowhead Stadium on January 12, 2019 in Kansas City, Missouri. One snowball almost hit Colts punter Rigoberto Sanchez during a kick. Chiefs coach Andy Reid was summoned to the corner of Arrowhead Stadium during Saturday's playoff game against the Indianapolis Colts to get fans to stop throwing snowballs on the field.